The temperature suddenly rose, the barometric pressure fell - and thousands of termites took flight! This was the first swarm of the season, and provided a welcome food-boost for a few tiny skinks that also appeared from nowhere. 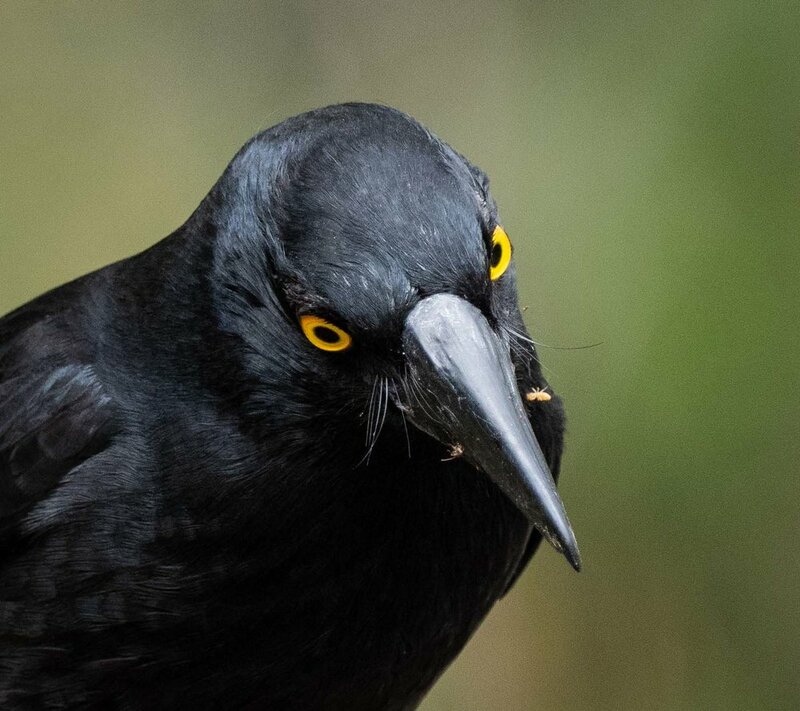 Currawongs have a reputation as nest-raiders and killers. Fair enough. 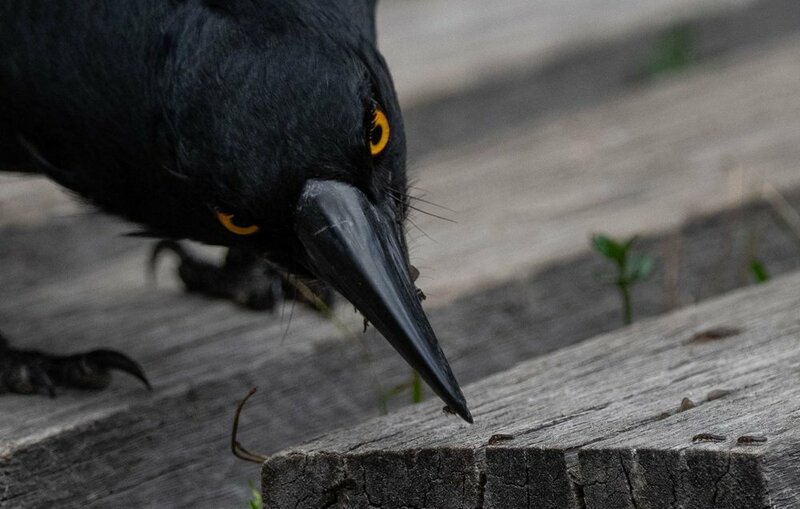 But, like their cousins the butcherbirds and magpie, they’re actually opportunists. The termite swarm was an opportunity indeed! 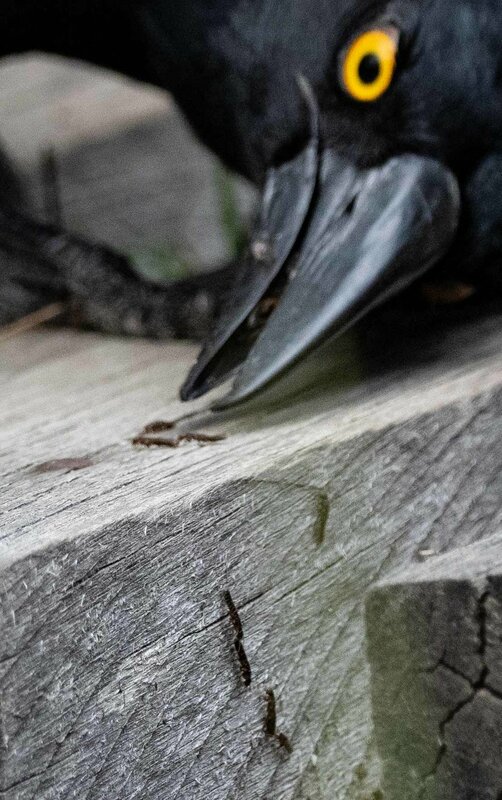 When pecking at tiny, fast-moving termites, such a massive bill seems a distinct disadvantage. Flowers of the Common Heath are somewhat less than common this year. A display like this one is an exception. The drought is no doubt to blame. Many buds are simply dropping off without opening. The drought also has secondary effects. The macropods are hungry! 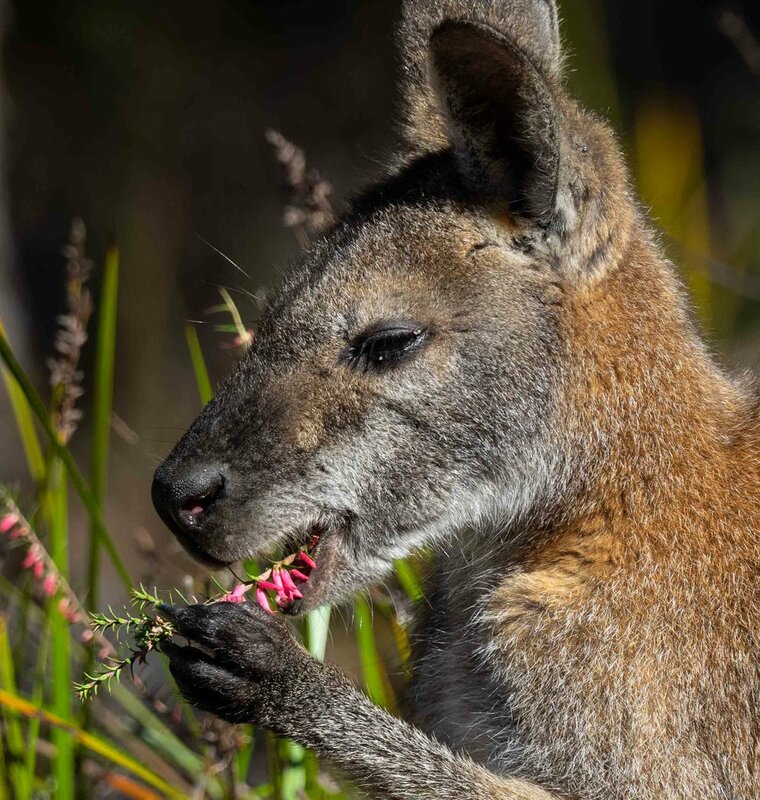 Wallabies are boldly devouring anything palatable … and even some plants that appear a little less than palatable! 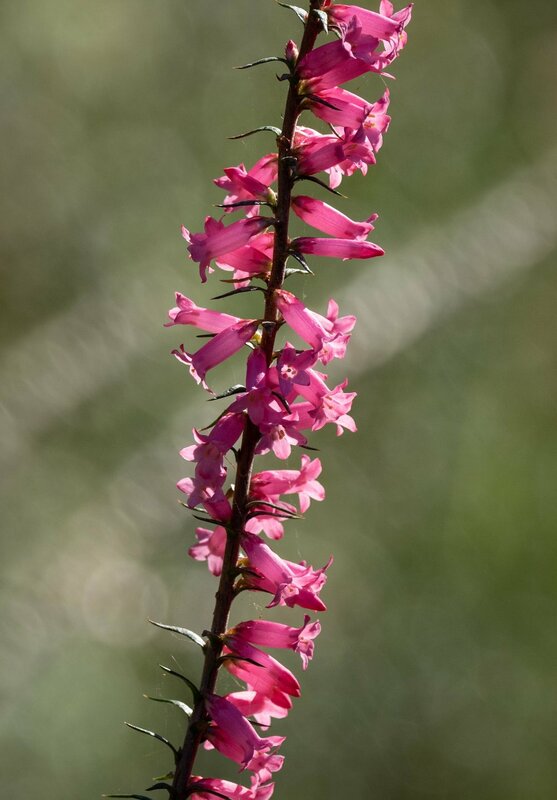 Epacris impressa has hard, pointed leaves that are spiky to touch. Yet this defence isn’t quite enough to save the flowers. After such a long dry spell, we've had to search to find Winter orchids. There is a low-lying area, behind a local beach, which is usually covered in orchids during Aug-Sept. But this week we found only a handful of flowers. Large patches of the mossy ground had been thoroughly raked over by hungry lyrebirds and excavated by wombats. We visited a second, nearby site – one we know as a reliable hot-spot for a diverse array of native orchids. Same story. Well, less lyrebird activity, and lots of orchid leaves, but very very few flowers. 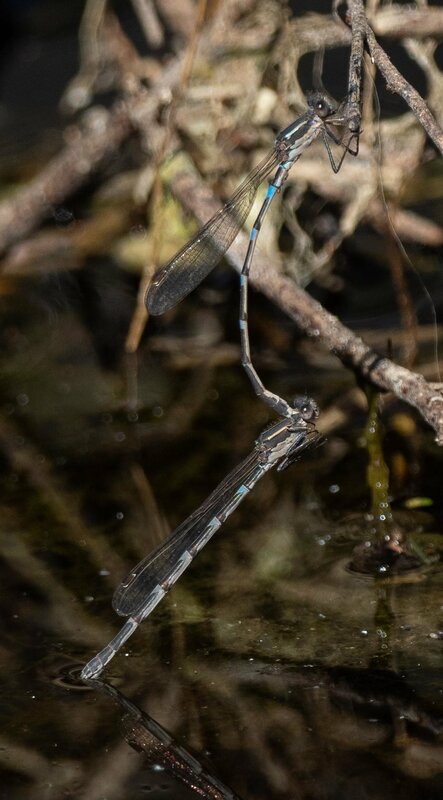 We were surprised to see dozens of these tiny damselflies swarming over a beachside lagoon this week. Surprised because it’s early in the season. National records (on ALA) for this species are mostly for Oct-Feb.
And surprised because I’m sure the water must be a bit salty. There is clear evidence of recent waves crossing the beach and flowing into the small, shallow lagoon. Austrolestes io has an unusual distribution. Most sightings are from the south west of WA, or from Tasmania. There are a scattering across Victoria, but very few into NSW. We've seen the species here before, but just once. The frog chorus around the pond has been building for a few weeks now. So, torch in hand, I braved the chill and went to investigate. Here is one of those responsible for the calls. A short time later I returned to the pond and spotted this one. Is it the same individual? Is it even the same species? These two species are very similar. The differences come down to the relative width of the toe pads, and the overall body shape ('squat' vs 'more elongate'). An experienced frog watcher might spot the difference, but I admit that I'm struggling. I plan to seek help! The croaking did attract some attention. I assume this frog, swimming nearby, is a female. 'She' has a pale throat, and did seem to be approaching the calling male (#2, above). 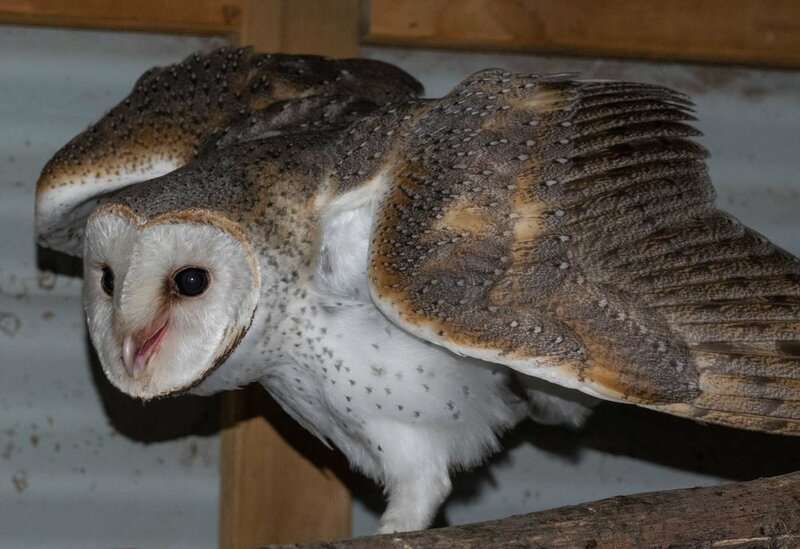 ... an owl had slipped into the coop overnight, through a door left just slightly ajar. Too good an opportunity to pass up! I grabbed my camera and headed over. I had never seen a wild Barn Owl. 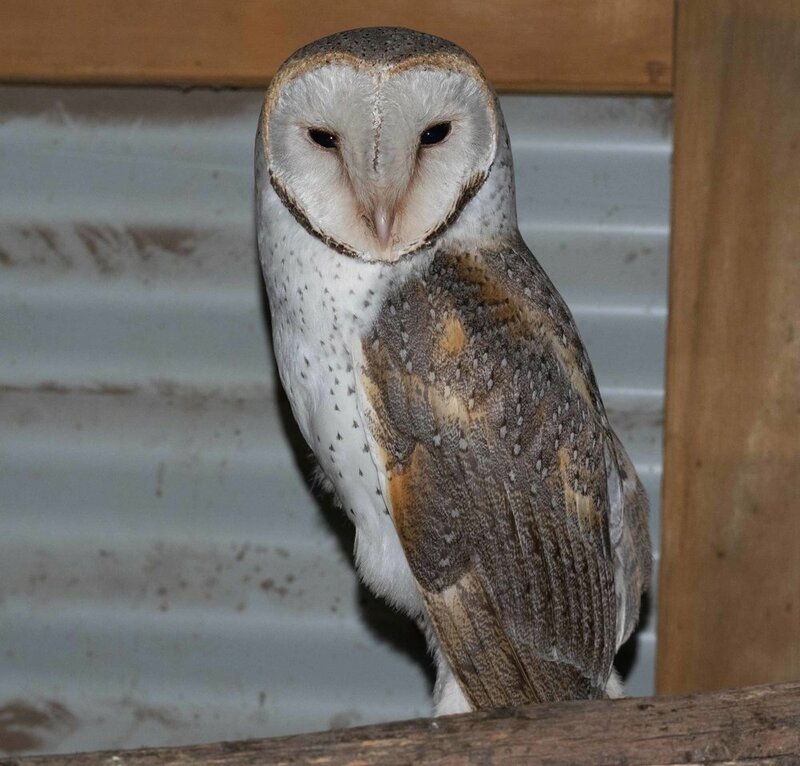 And, unlike the distinctive calls of the Powerful Owl and Southern Boobook, the Barn Owl is a quiet species. We don't hear them, so never know if they are around the area or not. It seems they are! The brown feathering identifies this as a female. A beautiful bird, and a rare treat for me.